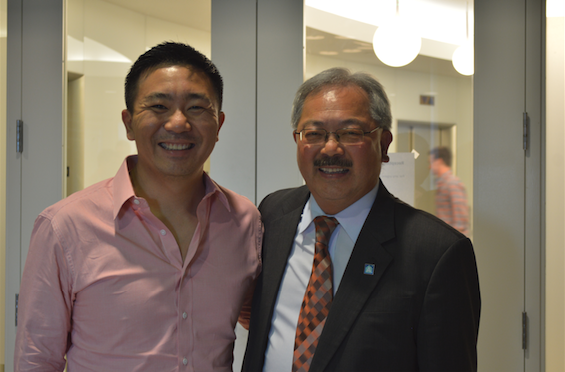 I first met Mayor Ed Lee at a networking event for entrepreneurs three years ago, when Credit Karma was a much smaller company. As a newer CEO then, I was just looking for anybody to tell our story to. Meeting the mayor, I was immediately impressed by his ability to listen and to hear our visions and concerns as San Franciscans and entrepreneurs. It was a pleasure last week that Credit Karma, years after that much more informal meeting, got to host a town hall with Mayor Lee in our Market Street office, as part of his Tech Tuesday program (understandably, he did not remember our first eeting). The mayor’s quest with Tech Tuesdays, in his own words, is to visit as many of our city’s 2,400 tech companies as he can in his time in office. He spoke with Credit Karma staff for over half an hour. After running over a bit of his personal background in city government, Mayor Lee took questions from Credit Karma employees about the city, covering things like future plans for municipal wireless internet, affordable housing and transportation development. We applaud Mayor Lee’s efforts to open a clear line of communication with the city’s tech industry and his work to keep top talent in San Francisco. The way the city of San Francisco blends social values with city business is any in many ways similar to what we’ve tried to build on a smaller scale at Credit Karma: a company that listens to all of its employees and also mixes doing business with a mission to make life better for our members. I’d like to thank the mayor for his time and for visiting (and everyone that came out to listen). You’re welcome back any time!